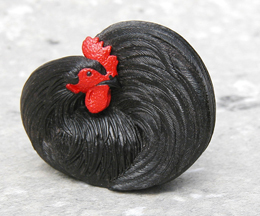 Rooster --This miniature rooster is among artist Nick Lamb's netsuke carvings. Lamb will demonstrate carving netsuke, miniature wooden Japanese toggles, at the UW Art Museum Monday, Oct. 5, at 6 p.m.
Montana sculptor Nick Lamb will demonstrate netsuke carving Monday, Oct. 5, at 6 p.m. at the University of Wyoming Art Museum. Lamb in 1983 carved his first netsuke, a small wooden toggle worn with traditional Japanese clothing, and has since become one of the most celebrated non-Japanese carvers of netsuke and other traditional Japanese miniature forms. He began his formal training in graphic design at Berkshire College of Art in his native England. In 1973, Lamb started woodcarving as a hobby and by the early 1980s he had won several woodcarving prizes. His work has been exhibited internationally, including the British Museum, the Herbert F. Johnson Museum of Art at Cornell University, the Museum of East Asian Art in Berlin, the Chiba City Museum of Art in Japan and the Museum of Art & Design in New York. Most recently, Lamb's work was included in an exhibition at the Japanese Embassy in Washington, D.C.
Lamb's carving demonstration coincides with the exhibition "Ichiro: Netsuke, A Life's Work, The Huey G. and Phyllis T. Shelton Collection of Ichiro Inada Netsuke." The collection was gifted to the museum by museum patrons Phyllis T. Shelton and Huey G. Shelton. It is the largest known collection of netsuke by the master 20th century netsuke artist, Ichiro Inada.